​On Monday afternoon August 26, 1946, John M. Ross had just come out of the sitting room after “rather quickly” turning off the radio. When his wife Georgiana asked, he said “...those horrid strikes" and he didn’t care to listen further. He had retired as manager of Hakalau Plantation about 4 years before, having worked there since 1895, and they had moved to Ninole at the northern boundary of the plantation. He was 78. Months before, the 1946 tsunami had wiped out the mill and now there was an industry-wide labor strike looming. ​She continued to live in their Ninole home and, in later years, moved to Hilo where she passed away in 1967, but we could mark August 1946 as the end of the Rosses of Hakalau Plantation. It covered over 55 years in all. John is central to the story, but his older brother George was manager before him and his younger cousins, George the overseer and William the store manager, also had a significant presence here for decades. Though few still living actually knew him, those who grew up here in plantation days think fondly of John M. Ross because of his active participation in the betterment of the community, particularly with the kids. We will give that the attention it deserves but will also introduce the other Rosses and cover a few subjects related to their lives. Along with the aloha John most clearly represented, there was white privilege, paternalism and the particular story of the Scots who predominated on the plantations along this coast. The Rosses lived in that era, so we shouldn’t be surprised that they were influenced by it. It starts with George Ross, the manager from 1890 to 1905. His time at Hakalau was affected by political, business and social conditions which influenced some difficult labor relations. John M. Ross followed as manager from 1905 to 1942. He was probably the best of what a plantation manager could be in his time and we tell his story that way. Younger cousins, George was overseer from 1909 to 1942, and William was store manager and postmaster from 1902 to about 1935. They both had a leg up in making their start here, as did John, but they made Hakalau their home, raised their families here, made their mark, then moved on after retiring. 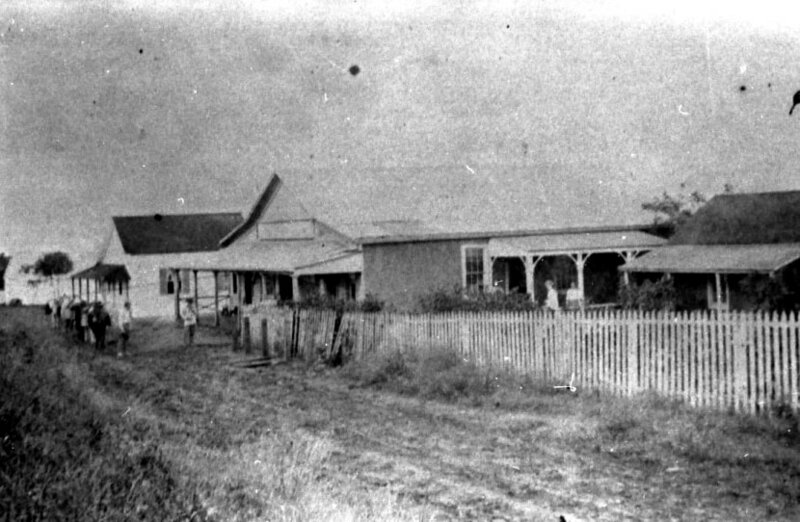 Younger cousin George became John’s right hand man and William managed one of the main plantation stores on the Hamakua coast. Not without its shortcomings, this era was probably the high point for the sugar industry along this coast. ​He started it all. About 15 years as Manager at Hakalau (1890-1905) and about 27 years residing in Hawaii. Originally intending to go to Australia from his home in Scotland, he ended up in Maui in August 1882 at age 24 and worked up to the position of head overseer at Hawaiian Commercial and Sugar Co. (Spreckelsville), the biggest, most productive plantation in the islands at the time. He became manager of Hakalau in 1890, also then owned by Claus Spreckels, the “Sugar King”. In April 1891, he married Katherine Lishman, a 21 year old from a notable English family from Honolulu. Father Robert Lishman was an architect and builder there with political ties to the Kingdom. They had 2 children here in Hakalau. He takes over as manager in 1890. When he started, Hakalau Plantation had 4,000 acres, produced 50 tons of sugar a day and employed 650 men. These men and their families lived in numerous camps throughout the plantation’s lands, some 6 miles of coast from near Kolekole to Ninole and from ocean side to about 1,200 ft. elevation. ​The infamous lynching of Katsu Goto in Honokaa had recently taken place in October 1889 with evidence that the plantation manager was complicit. During the trial, 400 Japanese workers from Hakalau Plantation marched to Hilo to protest their working conditions. Though a singular incident and shocking even then, this lynching stood as the very worst of what was possible in this period. We can assume that all of this was on George's mind as he began. This is harsh, of course, but in the 18 responses from managers throughout the islands, you also see a recognition of the problems caused by managers, overseers and luna when laborers are ill-treated. Managers varied in their attention to this problem but at least understood it as a cause. We can’t know how well George did, but if his brother John is any indication, we might guess. Still, most were quite stuck in misconceptions about race, social class and white privilege. Their handling of difficult problems related to contracted labor in particular was colored by these misconceptions. And, until Hawaii became an American Territory in 1900, the Master and Servants Act (passed by the Kingdom’s Legislature in 1850) provided a legal basis that supported these views. The times are changing. Claus Spreckels owned Hakalau Plantation in this time as well as the one George first worked for when he arrived in Maui in 1882. The so-called Sugar King, Spreckels had been a poker-playing companion of King Kalakaua and won political favors in return for personal loans. But this period was passing and his place in the industry was changing. Oversight from plantation owners and the U.S. government would begin to affect manager autonomy in his period. With the annexation of Hawaii as a U.S. Territory (1898), contract labor became illegal and the American government began to scrutinize the plantation system for its “feudal” aspects. Also, the Hawaii Sugar Planters Association (HSPA) was formed by plantation owners (1895). For largely business reasons, it began to push industry-wide initiatives focused, among other things, on improving living conditions for the labor force. It appears that Hakalau took full advantage in the coming years. Nepotism? He did help his younger brother John M. Ross establish himself as manager. But, by most all accounts, that was a good thing. 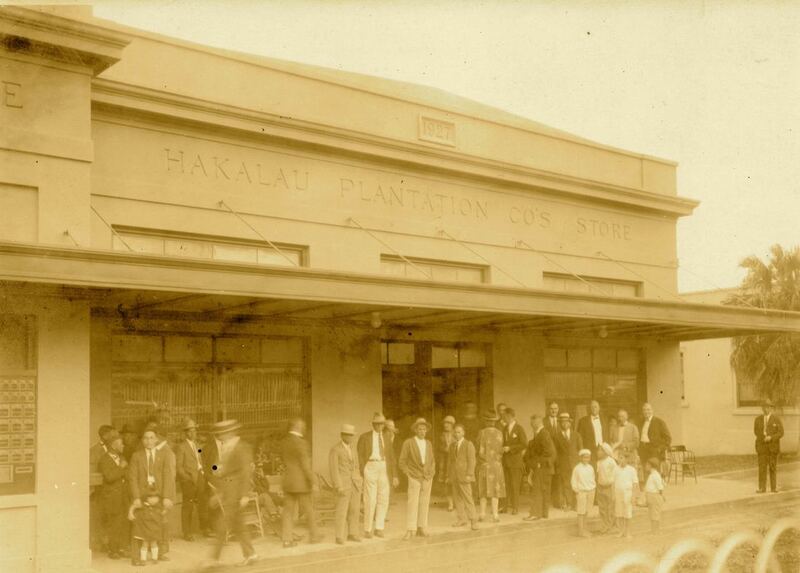 And cousin William, the store manager, started at Hakalau in 1902 as a clerk, not a store manager. So “yes” to the charge of favoritism based on kinship but “no” to the charge of favoritism regardless of competence. 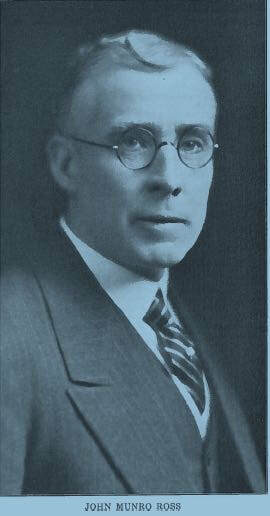 Head Overseer for about 8 years (1895-1905), then Manager for 37 years (August 1905 – August 1942). He arrived in Hakalau from Scotland in January 1895 at age 26. (Interestingly, brother George had made a trip from Hakalau to Scotland the year before.) In 1898, still single, he moved in to the manager’s new residence and lived with his brother George and family. In December 1902, at age 33, he traveled to Pennsylvania and married his fiancé, a Scot he had known as a child (Georgiana Stewart, age 27). He had likely visited with her while on his 1901 trip to Scotland. It became a close relationship. And, as you'll see, he was much respected in the Hakalau community and in the Big Isle business community. Hamakua was also known as the “Scotch Coast” during this time so no surprise where he came from. 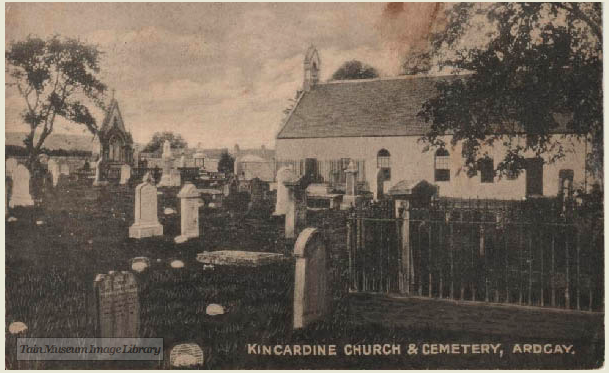 Born in the hamlet of Kincardine in northern Scotland on August 12, 1868. In his early adult life, he was “engaged in farming and railroad work”. He sailed from Glasgow in December 1893. A description of him in a later passport application: Height 5' 11 3/4", ruddy complexion, blue eyes, thumb on left hand disfigured. Photo from Men of Hawaii, Vol. 4, 1930, page 424. Known as one of the foremost agriculturists of the Hawaiian sugar industry, through his many years of service as manager of Hakalau, Mr. Ross believes deeply that the prosperity of coming generations in the Islands lies in the land, and he has been an active leader in the movement to encourage boys and young men to take up agriculture as their life work. Hakalau has become a model plantation in the promotion of this important work. John M. Ross Chapter, Hakalau School, March, 1930 Back row (honorary members): J.M. Ross, E.S. Capellas, A. Costa. Middle row: Adviser T. Maneki, W. Ouye, Juko Miyashiro, Seiko Miyashiro, Samuel Maeka, Isamu Takemoto, Matsuzen Nakamura, Taft Penarosa, Yoshito Sakamoto, Minoru Meguro, Ernest de Lima, Adviser Mrs. Lujan. Front row: Edward Maeka, Sadayoshi Furumoto, Takeshi Teruya, Shigeo Isaki, Kuruwanbu Morita, Yoshio Oba, Masaru Morikone, Siberio Santiago, Jikichi Miyashiro. Photo from the Waichi Ouye Collection, courtesy of his family. 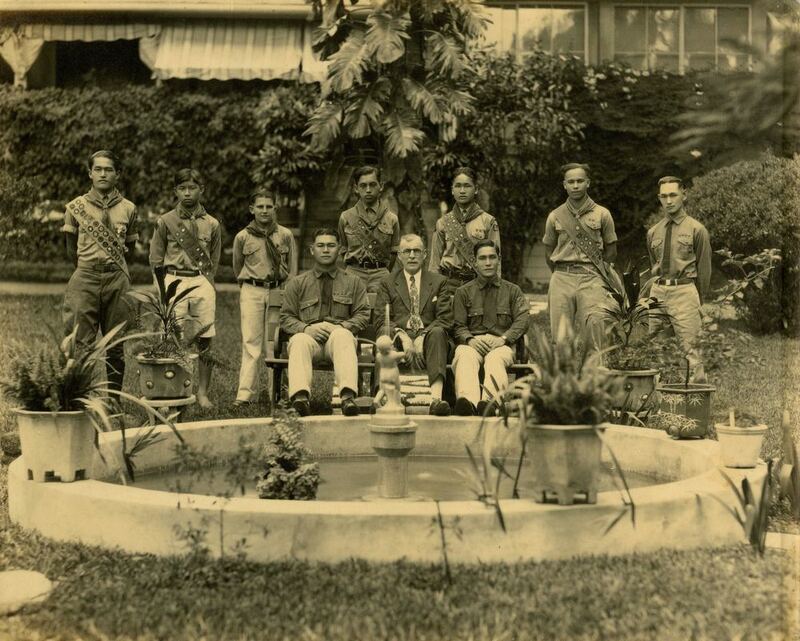 Merit Scouts, Officers and Troop Chairman, in the front yard of the Hakalau Plantation Manager's home, 1930. Standing L to R: Eagle Scout Harry Urasaki, Life Scout Shigeru Ito, Star Scout Theodore Machado, Star Scout Masawo Tanaka, Eagle Scout Waichi Ouye, Star Scout Daniel Gonsalves and Asst. Scout Master Nishioka. Sitting: Scout Master Morikawa, Troop Chairman J.M. Ross, and Asst. Scout Master Furusho. Photographer Shigeharu Furusho. Photo from the Waichi Ouye Collection, courtesy of his family. 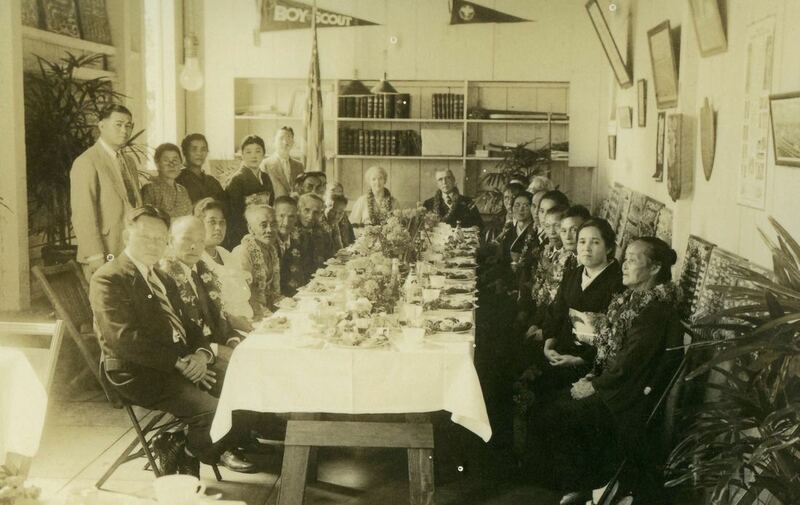 Hakalau Jodo Mission Japanese Language School 30th Anniversary (circa 1934). Honorees: Mr. Koya, Mr. Miyashiro, Mr. Yokoyama, Mr. Fujinaga, and Mr. Kikuchi. Others in attendance: Mr. and Mrs. John M. Ross (he is described as the plantation owner), Mr. and Mrs. George Ross (he is described as the plantation vice owner), Rev. and Mrs. Yamanaka. Photograph is on display at the Hakalau Jodo Mission. Photographer unknown. 40th Anniversary with the Hakalau Plantation Company, January 20, 1935. Georgiana and John Ross sit at the head of the table. Photo from the Waichi Ouye Collection, courtesy of his family. Donald, first of all be true to yourself. Never deceive yourself and you will never be false or deceiving. Donald went on to name one of his sons John Munro Ross. He takes over in 1905. In addition to the labor force, his brother handed down a “staff.” The head luna (field supervisor), Alex Smith, was a Scot. There were about 10 luna under him, a mix of “White” and Portuguese. Two mill engineers, a blacksmith and two bookkeepers. Cousin William was Hakalau Store Manager and J. Paterson managed the Honohina Store. Fred Irwin, Physician and Surgeon, lived in Hakalau and served 3 plantations with no hospital. Housing for the labor force was poor with many camps scattered throughout the plantation lands, both mauka and makai. Serious attention to this and other laborer-related shortcomings had not yet begun. The “outsiders” who got their mail at the plantation-based Post Office remind us that 1905 was a very different time in the area of Hakalau. They included several Hawaiian land owners, three Hawaiian taro planters from Umauma, some merchants, a stage driver and a tinsmith. C. Brewer & Co takes over in 1910. Five years after John started as manager, C. Brewer & Co took over as owner and “agent” of Hakalau Plantation. Under Spreckels, the agent just arranged the shipping and sale of sugar. C. Brewer handled the plantation finances, records, taxes, purchases and general oversight. John’s responsibilities were still considerable, but the idea of the Manager as King (or feudal lord) diminished during his time, and this is one of the reasons. Labor strikes, not so much in his time. The industry-wide 1946 strike started about 5 days after John passed away and lasted a month and a half. The impact on Hakalau was significant and more would follow in the 1950s. In his time, strikes mostly happened elsewhere, though their outcomes could affect Hakalau. The 1909 strike by Japanese on Oahu finally ended wage differentiation based on nationality. The 1920 strike on Oahu with Japanese and Filipinos demonstrated collaboration. During the year the labor situation has been very much disturbed but we are pleased to report that, notwithstanding the constant agitation and unrest, our labor as a whole has behaved wonderfully…with minimum interruption. Lucky for him that Filipinos were not a large percentage of the Hakalau workforce at this time. All in all a very segregated community! Equal rights didn’t exist back then! The [Hakalau] theater was a perfect example of this. The upper left balcony was reserved for whites, the right for semi skilled, and all others were limited to the main floor. It never occurred to us that it might have been different. He often remarked on the effects of rainfall on the crop yield –too wet or too dry. Also, the quality of “the juices” varied from year to year. Federal “fair labor” standards started – “…we will have to face heavy expenditures for housing on account of the eight-hour law, requiring more men…” A number of houses were built in 1938 but, with increasing mechanization, the general trend going forward was a slow decline in the number of laborers needed. Community infrastructure During this time, Hawaiian Sugar Planters’ Association (HSPA) committees studied workers’ complaints and recommended solutions. Standard plantation-worker house designs were distributed industry-wide. Almost all of the housing and community buildings present in Hakalau Plantation in the 1940s and beyond were built during John’s time. Under Mr. Ross’ guidance, Hakalau Plantation many years ago became known throughout the Hamakua coast as a model agricultural community. Its ever freshly painted houses, well kept gardens and parks, and neat flower bordered roads were a delight to the eye of travelers on the Hamakua belt road [the old belt road went right through Hakalau]. As a result it became a point of pride for laborers and lunas (overseers) to be able to say they worked on Hakalau Plantation. ​A 1st generation Scot on the Plantation. Family connections. A newly arrived Scot could have "a leg up" for a plantation job. Often this was a family connection. John and his younger cousin William were fortunate because of brother George’s position as Manager. In turn, George the younger (see below) was fortunate because of his older cousin John’s position. Hamakua was sometimes called the “Scotch Coast” in this period. Some reasons: 1) Many Scots emigrated because the country’s economy could not provide enough employment opportunities. This was particularly true in farming communities. Like many others, John and George came from such a background. 2) We should give some credit to the view that they often proved themselves as hard working and competent overseers and managers. 3) A Scot who settled into a plantation job was usually connected enough to have a good idea about the developing opportunities and could communicate that to his countrymen back in Scotland. His ties to Scotland. John’s allegiance to America appears to have come easily. He saw to it to be naturalized as soon as Hawaii became a U.S. Territory in 1900. But his ties to Scotland and its culture remained strong. ​For this 1st generation of Scots living in Hawaii, “vacation” trips back to Scotland were surprisingly common though difficult and quite time consuming. John made a number of them. His 1920 trip was intended to last 8 months. Other trips to Scotland we found in passenger lists and newspaper articles occurred in 1901, 1924,1928 and 1935; all with his wife. Finding a Scot bride. 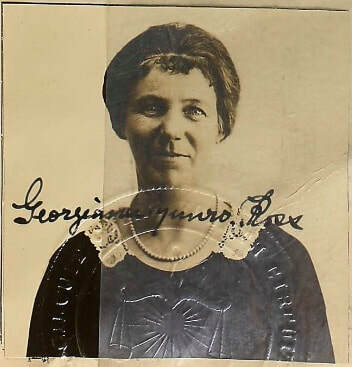 Georgiana traveled from Scotland to her uncle’s home in Pennsylvania in 1901. John had known her when she was a child but it had been about 8 years since he’d left Scotland. How did it happen that they were engaged before he made the trip to Pennsylvania in 1902 to marry her? We don’t know the particulars but there are numerous examples of similar arrangements or understandings among these 1st generation Scots. The closest example is his younger cousin William, the store manager. At age 35 and after about 12 years in Hakalau, he married someone from Scotland. It appears this was a long-distance development that included a series of letters between them. It appears that Georgiana was a good match. One of the characteristics of Hakalau was its appearance. For anyone by this plantation, the road was lined with various plantings, all due to her efforts. John M. Ross School was appropriately named since Mr. Ross, as manager of Hakalau Sugar Plantation, contributed not only building materials and funds, but truly supported its establishment, seeing the necessity to provide proper education to children of these growing communities. Many alumni fondly remembered Mr. Ross as an avid supporter of the school and the Ninole and Honohina communities and their adjoinng plantation camps [all part of Hakalau Plantation]. After the loss of her husband,…[Mrs. Ross] took a special interest in John M. Ross School and made many donations when she found out there was a need. She was also a frequent visitor to the school during their special programs. Hakalau – After graduation exercises of the 1942 class for Hakalau Intermediate School, John M. Ross, manager of Hakalau Plantation, was honored by the Hakalau PTA and the School. August S. Costa, president of the local PTA, expressed the sentiments of the organization towards Ross who is retiring at the end of June after 47 years of service at the Hakalau Plantation… A gift was presented to Ross by the PTA. E.S. Capellas, principal of the school, spoke on behalf of the faculty and the children who are, and have been obligated to Ross for many, many favors… To honor Ross, Hakalau Intermediate, the teachers and children contributed to the acquisition of an enlarged picture of Ross to be hung in Capellas Hall. ​There is to this day the John M. Ross Foundation (Bank of Hawaii, trustee). It was established by his wife in 1963 to fund Big Island projects benefiting teens age 11-18, following his interest in the kids. Below is a photo taken in 1950 of Hakalau Boy Scout Troup 5 visiting the gravesite of John M. Ross on the occasion of his birthday. In the suit, also paying his respects, is Reverend Mamiya of the Hakalau Jodo Mission. The Scouts did this for about 15 years after he passed away. August 12, 1950. Boy Scout Troup 5 of Hakalau at the grave of John M. Ross at Homelani Cemetery commemorating his birthday. From the Waichi Ouye Collection, courtesy of his family. To John M. Ross, he was a first cousin, twice removed. He arrived in Hakalau in 1902 at age 23. Brother of George the Overseer (see below), he served as Hakalau Plantation store manager and postmaster for about 33 years (1902-1935?). Married a Scot (Mary McClean) in Hilo on June 8, 1911. They raised 4 kids in Up Camp Hakalau, near the Manager’s residence. He moved to Honolulu when he retired and lived there for another 15 years until he died in December 1955 at age 76. His wife moved to Highland Park, Illinois and died there in June 1970 at age 86. He started working in the “old” Hakalau Store and transitioned to the “new” one in 1927. Old Hakalau Store. Photo from the Waichi Ouye Collection, courtesy of his family. Opening Day at the new Hakalau Store, January 27, 1928. Photo from the Waichi Ouye Collection, courtesy of his family. We are pleased to draw your attention to the creditable showing of our store. This is due to the fact that we are selling at lower costs than many others, and not a few customers come all the way from Hilo to deal with us. We must, therefore, give credit to careful purchasing. In this time, a plantation-run store usually did not make a profit. It was there because it met a need. It was often able to charge lower prices than other stores. But because a worker was allowed to run up a tab (due on payday), this could have the effect of locking him into being a regular customer. To John M. Ross, he was also first cousin, twice removed. Brother of William the store manager. He arrived at Hakalau in 1909 at age 25 and served for about 31 years, first as “timekeeper” until 1918 when he became John Ross' right hand man (“head overseer”, then “assistant manager”). Around 1921, he married a 28 year old teacher. Esther Bentley was from Michigan and had been working in Oregon when she moved to Hawaii in Sept 1919. She was teaching at Hakalau School. They raised 3 kids in Up Camp Hakalau, near the Manager’s residence, and she continued teaching at Hakalau for periods of time. He retired about the time John did (1942) and moved to Portland, Oregon, living there for another 22 years until his death in 1963 at age 79. His wife died there in 1987 at age 94. It appears John M. Ross played favorites and, in 1909, hired his younger cousin. But it also looks like George had to earn his place. He stayed in the position of “timekeeper” for 9 years. For the plantation in that time, this was considered an entry job for a white man. Nevertheless, from 1918 until the both of them retired in 1942, he was by John’s side as “assistant manager”. With John’s responsibilities in Hilo and his trips to Scotland and elsewhere, George had periods on his own as “acting manager”. John had to have trusted him for that. 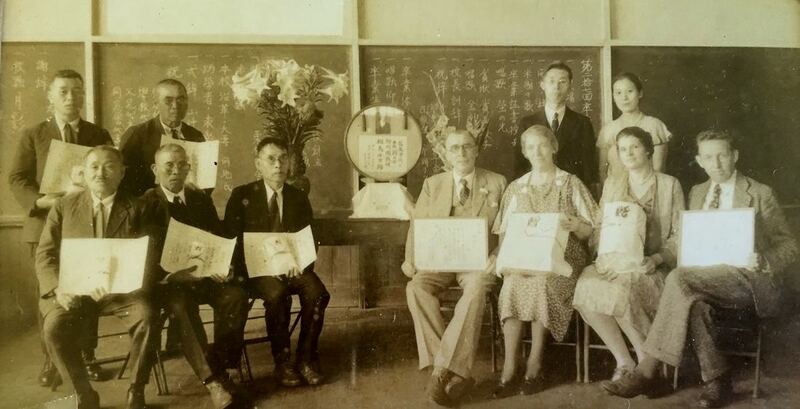 Taken from the picture of the Hakalau Jodo Mission Japanese Language School 30th Anniversary (circa 1934). From Left to Right: John M. Ross, Georgiana Ross, Esther Ross, George Ross. ​Last word. 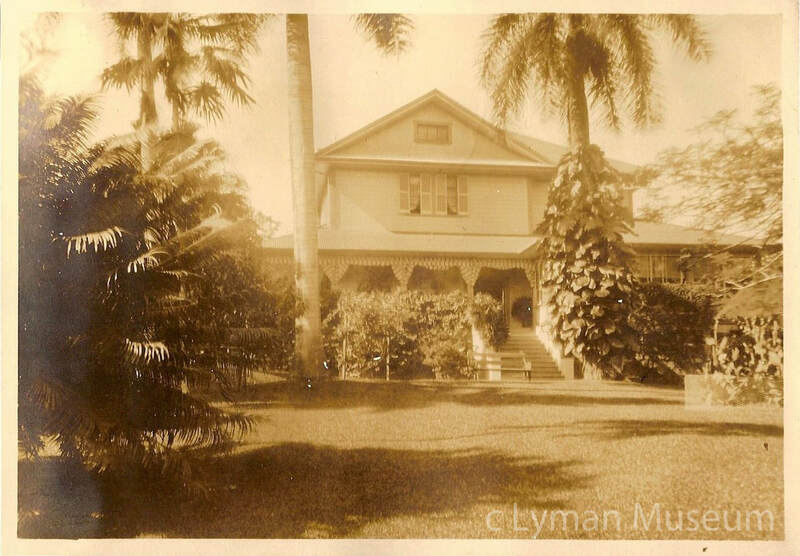 We can take for granted that there are many interesting family stories in the history of Hakalau Plantation. This one was more high profile and is better documented than most. A particular slice of plantation life during a particularly interesting time.